I left the Everglades Sunday am after leaving my first official camping night in a campground. My plan was to go to Port Charlotte on the golf coast and play a round of disc golf before visiting my friend Clay and his wife up the street. I started getting a bit concerned when I saw the line of clouds that was ahead of me. After stopping for an iced tea at McDonalds I arrived at the park and parked, got my discs out of storage under the bench seat and as I was exiting the camper I hear an air horn blast. I walked over the man with the horn kind of knowing the response, and my thoughts were confirmed they were just starting a tournament on the course with 5 people per tee and a shotgun (air horn start). I called Clay and luckily he was available 1.5 hours early so I went to meet him. Clayt and his wife have a wonderful looking double-wide in a well managed park. Clay's in laws have had a place there before they bought one about 10 years ago. Jan was busy working at the computer and although I had seen Clay at the station only a few weeks before, we talked for awhile catching up on things. Clay then took me on a tour of their park and common areas. Unlike other parks that I have seen, this one has a woodworking shop in its own building. Clay and his father in-law are good woodworkers and the shop is right up their ally. I failed in not getting a photo of their nice place with water in the back that also has alligators in it and failing to get a pictur of the wood shop and the fine addition the have just put on. Clay was a very good Lieutenant in the fire department and I missed him when he was not able to work anymore due a work related injury that keeps in check from doing certain things. He is an overall talented guy with great skills. I am hoping to give him a hand as heat need it this summer back in Westminster working on his antique fire truck he has had for so many years. After my nice visit with Clay I was ok with missing the disc golf. 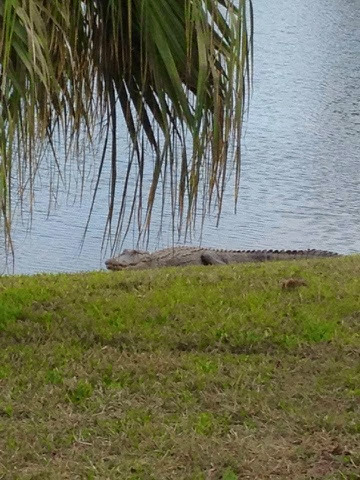 Here is the picture Clay posted on Facebook a few days ago of the alligator in his back yard.